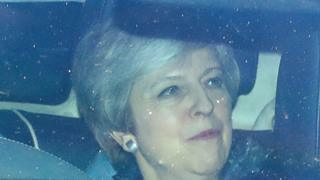 The i and Metro focus on comments from one of Theresa May's party leader predecessors - Iain Duncan Smith - that she should quit before next month's European elections. Meanwhile, the Daily Telegraph says Chancellor Philip Hammond gave a speech in Washington "pouring scorn" on Michael Gove, Boris Johnson and Andrea Leadsom - who all failed in their bids to become Tory leader in 2016. It quotes Mr Hammond saying: "Gove and Johnson knifed each other in an unintended suicide pact... then Leadsom knifed herself in a private suicide pact." The Telegraph says the comments resonate as "a succession of leading Tories" line up to replace Theresa May, including Home Secretary Sajid Javid who is due to address 100 police and crime experts today. But, writing on the Spectator website, Toby Young argues that's what the Tories need - an "unapologetic Thatcherite" who doesn't always try to be politically correct. A picture of a triumphant Tiger Woods - arms aloft, roaring with joy - appears on most of the front pages after his victory at the Masters in Augusta. The Daily Telegraph calls it "the greatest comeback since Muhammad Ali", while the i declares: "The big cat is back on the prowl." The Sun's Dave Kidd is awestruck. "Even after he suffered complete personal and physical breakdown, there he was, striding down the 18th fairway to claim a fifth Green Jacket," he says. The Daily Mirror points to the countless operations the 43-year-old has needed in recent years - including career-saving spinal fusion surgery. This has made Woods a different man, Mike Atherton suggests in the Times, one "held together by metal, humbled in the past, aware of his vulnerabilities, and, as a result, more humane". Another living legend to hit the headlines - though for less happy reasons - is Dame Joan Collins, whose central London flat caught light on Saturday afternoon. On its front page the Daily Express announces: "999 crew treat Dame Joan after she flees flat blaze." "Joan's fire hell," is the headline in the Mirror, which says her husband fought the "terrifying" blaze. The Sun says the fire "blackened walls and window frames", and is still under investigation. The Guardian interviews the country's president, Lenin Moreno, who claims the WikiLeaks co-founder tried to use the embassy as a "centre for spying". Mr Moreno accuses Mr Assange of "absolutely reprehensible behaviour", suggesting he "mistreated" embassy staff during his near-seven-year stay, and repeatedly violated his asylum conditions. Mr Assange's lawyer, Jennifer Robinson, said Ecuador had consciously made "pretty outrageous allegations" about him to justify his arrest last Thursday. The Times also carries an appeal from Mr Assange's father to the Australian prime minister to bring his son home to Melbourne.